First things first, have your helicopter properly trimmed and set up before doing anything. Most electric models are already set up right out of the box. If your model requires any setting, make sure you follow the instruction in the manual or hire/ask someone knowledgeable to do it for you. Trimming won’t be covered in this article because it is a whole topic in itself. Once your helicopter is trimmed, you’ll need a simple pair of training gear for bigger models. You can actually make one yourself using two four-inch rods and four balls (ping-pong balls will do nicely). However, it may be easier to buy one. If you are learning with a co-axle ready-to-fly electric helicopter such as the Lama or Walkera 54, then the training gear is unnecessary. On the other hand, if you are learning with a bigger and more conventional model such as the T-REX, then having a training gear is absolutely mandatory. Now, you’re going to pilot your helicopter for the first time. However, for this first lesson, the goal is to learn what it “feels” like to control one. Therefore, what you want to do is to bring up the throttle/collective to the point where the helicopter is just about to lift off the ground but not quite taking to the air yet. With the helicopter in this half on the ground, half wanting to lift off phase, move the cyclic control around and see as well as get a feel of how the helicopter will react to each control. Do this several time until you have adequately felt all of the controls and more importantly, understand them. Once you’ve mastered the ground exercise, the next step is to hover. Every helicopter pilot and instructor will tell you that one of the most (if not the most) important component of a helicopter flight is hovering. In fact, no matter how fancy the flight, at its most fundamental level, a helicopter flight starts and ends with a hover. For this lesson, make sure the tail is pointing in towards you. Bring up the throttle to the point that the helicopter is just about to hover just as you did in the ground exercise. Then, get the helicopter as stable as you can get it. After doing that, give it a little more throttle/collective. Remember that you should make the helicopter stable on the ground first before giving it the extra throttle to lift it off the ground. Doing this will make this lesson much easier. When the helicopter starts to lift off the ground, it’ll continue to ascend slowly. 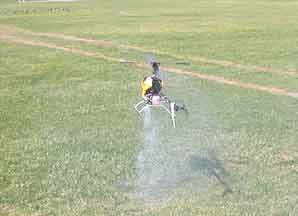 Bring the throttle down slightly to stabilize it at around 1 foot. Next comes the hard part. Try to keep the helicopter hovering in one spot. This will prove to be very difficult at first. Draw on what you’ve learnt on from the ground exercise. Once you’ve hovered for around 30 seconds, bring the throttle down just slightly and the helicopter will start to slowly descend back to the ground. Don’t throttle down too fast or your helicopter will come crashing down and be damaged. Try hovering many times. Between each hover, reflect on what you did right and what you did wrong. You will find that each hover will be more precise and more controlled than the last. Another important point during this lesson is to always point the tail of the helicopter towards you. Don’t try to point the helicopter in any other direction at this point as you will very likely get disoriented. Orientation training will come later. Once you’re comfortable with hovering at 1 foot, try bringing the helicopter up to an altitude of 3 to 5 feet. It will seem scarier but in fact, hovering at 3 – 5 feet is easier than hovering at 1 foot. Keep doing this exercise until you can hover for an entire flight of the battery pack or the fuel tank, which equals to around 7 to 10 minutes if you’re practicing on a simulator. Each pilot takes different amount of time to learn this crucial skill. Some get it extremely fast (within days) while others take weeks or even months. Don’t be discouraged, take your time and learn at your own pace. As long as you have fun while practicing, who cares how long it takes. Don’t rush through this lesson. It is very important that you learn to hover and can do it comfortably. Once you’ve mastered hovering, the next step is basic directional flight. Get your helicopter to hover as you’ve done in the last lesson, then pick a spot and pilot your helicopter there. Then pick another spot and do the same thing. At this point, you want to keep the helicopter in a tail-in position. Keep doing this until you feel comfortable that you can get your helicopter to go anywhere you want while it’s in a tail-in orientation. After having mastered hovering and basic flight while flying tail-in, the next step, the nose-in hover, will be relatively more challenging. The idea behind this exercise is quite simple; simply hover like you did lesson 2, but this time, hover with the nose of the helicopter pointed towards you. While this may sound simple, many new pilots find this extremely difficult due to the fact that most of all the controls are now reversed. At this point, you may already confident about flying and feel that you can easily perform this hovering exercise at a high altitude. Please refrain from doing that. Instead, start this exercise by hovering at 1 foot, then slowly increasing the altitude to 5 feet as you are more confident and comfortable with the now-reversed controls. Keep doing this exercise until you can master hovering with the nose pointed towards you. Having accomplished this lesson will greatly improve your orientation awareness. This final lesson will combine the skills you’ve learnt from previous lessons, namely, hovering, orientation, and direction flight. The combination of these skills will produce a full flight. The first goal is to try to navigate your helicopter in a square pattern. If you’ve been following the exercise without cheating, you’ll find that the square flight can be accomplished quite easily. The next goal would be to fly in a figure 8 pattern. This will prove to be more challenging but it is definitely not out of reach. As you do more and more figure eights, concentrate on keeping the 8 a perfect shape. Try your best not to veer off course. 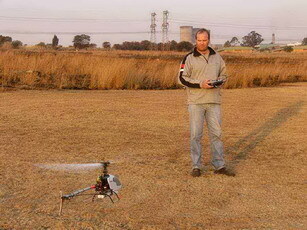 Becoming more experienced, you should aim for more and more flight control accuracy. Once you’ve mastered the figure 8, you should be able to pilot your helicopter anywhere you desire. Practice makes perfect, but also remember to have fun; after all, that is the whole point of a hobby.